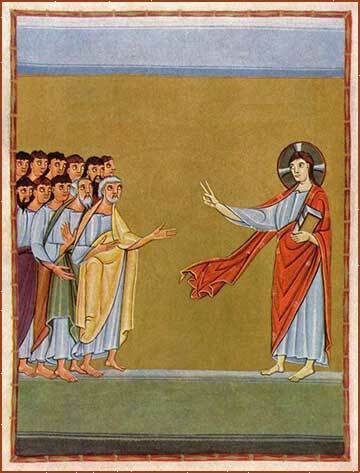 For some days he was with the disciples at Damascus. And immediately he proclaimed Jesus in the synagogues, saying, "He is the Son of God." And all who heard him were amazed and said, "Is not this the man who made havoc in Jerusalem of those who called upon this name? And has he not come here for this purpose, to bring them bound before the chief priests?" But Saul increased all the more in strength, and confounded the Jews who lived in Damascus by proving that Jesus was the Christ. In modern terms, Saul has "done a 180". He was the Sanhedrin's eager hit man, sent to round up everyone in Damascus who had become a follower of Jesus. But no sooner than he appears to the public in Damascus, he begins to preach the word of Christ himself! Instead of arresting the Christians, he tries to convince the non-Christians that Jesus was the Messiah. The anti-Christian Jews who were expecting Saul's arrival are naturally upset that the policeman has sided with the criminals, to the point that he is encouraging others to join them. Even worse, he becomes the strongest voice for Christ in the city. They determine to kill him as he leaves Damascus. But in one of many escapes we see in Acts, Saul bypasses the gates of the city by having his allies lower him over the wall in a basket. From his description and deeds, Acts presents Saul (later Paul) as a man gifted by nature. He is a natural leader, a man who has power to persuade others, and a man of enormous energy, intelligence and resourcefulness. The Sanhedrin had made him their man in the field in recognition of his great abilities; but now, the tide has turned. Their brilliant young champion has turned his coat, and the Christians will find him even more useful than the Jewish leadership.